Profiles of the Grossglockner Hochalpstrasse from the north and south. The Grossglockner High Alpine Road – or Großglockner-Hochalpenstraße – is named after Austria’s highest mountain (3,798 m). For cyclists, the road doesn’t get up that high, but the cobblestone road up to the “Edelweißspitze” reaches a respectable 2,571 meters. Since this side-road – starting at 2,394 m from Fusher Törl – is a dead-end, the ‘official’ pass height is at the Hochtor (2,504 m) making it the highest pass in Austria, ranked 7th in Europe. The Grossglockner features (annually) in the Tour of Austria and was also visited by the Giro d’Italia twice (1971 and 2011). The route from Heiligenblut (1,301 m) to Kaiser Franz-Josef-Höhe (2,369 m – 1,068 m of elevation over 16.5 kilometers). I revisited the Grossglockner in 2017, when (after) I participated in the Marmotte Hochkönig. I planned on tackling both ends in one ride – skipping at least the fork up to the KFJ Höhe – but I was unable to complete that mission, due to fatigue and the hot weather. So I settled for a round trip from Bruck to the Hochtor, with the Edelweissspitze on the return – report of that trip here and some pictures here (Google+). The northern ascend from the province of Salzburg is ranked as the tougher one. It’s 21.4 kilometers long up to the Edelweißspitze and 26.3 kilometers to the Hochtor – if you decide to go up and down the Edelweißspitze, you will have covered 29.5 kilometers. The toughest part is also the part with the more spectacular views, which will take your mind of the physical challenge a bit. Also the view down from (near) the Fusher Törl is quite spectacular. If you have paid the fee for a ticket that will earn you a ‘certificate’ when you get back down to the Ferleiten toll station*, you will have to stamp that at the Fuscher Törl memorial, just past the Edelweißspitze split. This memorial is located at 2,428 m and was designed by architect Clemens Holzmeister to commemorate workers who died during the building of the road. Just past the Fusher Törl, there’s a restaurant and souvenir shop, with quite a view, as seen in the picture below. Cycling on, you’ll descend for about two kilometers (166 altimeters) to Fuscher Lacke, after which you’ll climb the remaining 4 kilometers (241 altimeters) to the Hochtor, which is a 310 m long – and pitch dark – tunnel crossing the Alpine Divide – there’s a kiosk at the Carinthian side of it. The total elevation gain over this route, including the detour up and down Edelweißspitze, is 2,041 m (6.9% over the 29.5 km, or 7.9% over 25.7 km without descends). * You just pay for the ticket to time your effort – you do not pay toll when on your bike; only motorized traffic pays toll. Although it’s considered the easier ascend, its irregularity makes it (more) difficult. Plus, the official average incline of 5.7% is deceiving, because up to the Edelweißspitze there are some 6.5 km that are descends. Taking those out of the equation, brings the total elevation gain to 1,814 m or an average of 9.4% over 19.2 km. 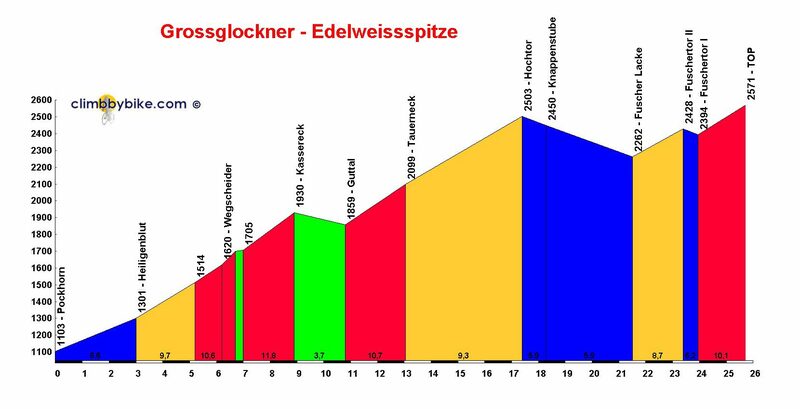 Which is actually worse than the ascend from Fusch, although that has a staggering average of 10% (over 14.3 km) once you pass the toll station up to the Edelweißspitze. From this end, upon reaching the Hochtor, you’ll pass through the tunnel and descend some 4 kilometers (241 m elevation loss) towards Fuscher Lacke, after which the 2 kilometer climb (166 m elevation gain) will bring you to the Fusher Törl. Another detour off the main road is the Gletscherstrasse, leading up (to) the Kaiser Franz Josef-höhe. This dead end starts at the roundabout Guttal – in the green zone in the profile picture to the left – and is some 8.6 kilometers long. With an elevation gain of 439 m (5%) it may not be that challenging, but the final 3.4 kilometers at a 7% average, enjoying a biting cold wind accompanied by equally cold showers, left me gasping for breath nonetheless. The scenery along this stretch is as overwhelming as the rest of the Grossglockner; the picture below is actually showing the road up to ‘the höhe’, as viewed from the Margaritzenstausee.